In the Young Sheldon episode “A Nuclear Reactor and a Boy Called Lovey”, while Sheldon (Iain Armitage) attempts to build a nuclear reactor, his grandmother Meemaw (Annie Potts) attends a university cocktail party with her 5’2″ companion Dr. Sturgis (Wallace Shawn). Things gets heated when Dr. Sturgis’ 6’4″ blond colleague, Dr. Linkletter, flirts with Meemaw. 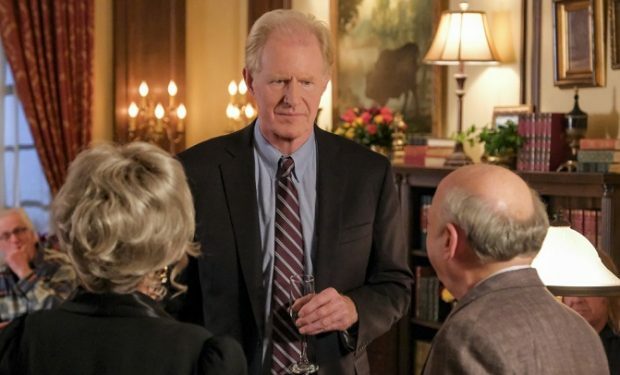 Tall flirting Dr. Linkletter is portrayed by Ed Begley, Jr. He’s known for his roles on Better Call Saul (Clifford Main), Arrested Development (Stan Sitwell), Portlandia (Doctor), Gary Unmarried (Dr. Walter Krandall), Veronica Mars (Cyrus O’Dell), Six Feet Under (Hiram Gunderson), 7th Heaven (Dr. Hank Hastings), St. Elsewhere (Dr. Victor Ehrlich), Battlestar Galactica (Greenbean), and Mary Hartman, Mary Hartman (Steve), among many others. Fun fact: Begley is the son of the late Academy Award-winning actor Ed Begley, who played Juror 10 in 12 Angry Men and Captain Wilson in Hang ‘Em High with Clint Eastwood. Young Sheldon airs Thursdays at 8:30 pm on CBS, right after The Big Bang Theory.